Six friends are meeting up for the first time in 10 years. It's also been 10 years since their childhood friend, Michael, was killed at Freddy Fazbear's Restaurant. After the group decides to go into the closed down restaurant, they awaken memories and monsters. I fully expected this book to be another drag in the reading slump I've been in lately, but I gotta admit, this book wasn't bad! 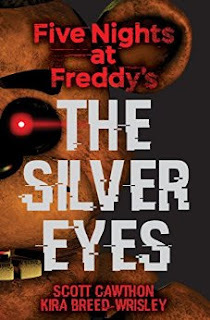 If you've never heard of the game Five Nights at Freddy's you may enjoy the book even more. The book is non-canon but that just meant the writers could have more fun with it. I read this book in just a few days because it was that entertaining! To be fair, it often reads like a stereotypical horror movie from the 80's where you want to shout "WHY ARE YOU GOING IN THERE?!" At the same time, though, there are some genuinely funny and genuinely creepy scenes. The chase scenes probably weren't as scary as the authors intended, but when they went for "creepy" over "scary" they got it down pat! (That reminds me, if you're creeped out by dolls, DON'T read this book.) As long as you don't expect brilliant dialogue and plot, I really think you'll like this book. I didn't care for the games, except to watch Let's Plays and I really had a good time reading this. In fact, I've already bought the next one. The book is definitely aimed at a Young Adult audience, probably the same people who made the games such a big deal. But I still found it appealing. The fact that it was set in the early 90's helped keep today's technology from interfering. I found the characters to be enjoyable, even if they did think like the teenagers they are. They kept going when they needed to. The freak-outs were understandable and their motives were good. If you're looking for a creepy read, want to know more about the Five Nights at Freddy's franchise, or are even just looking for an easy read with entertaining elements, I highly recommend this book. I had a much better time with it than I expected.